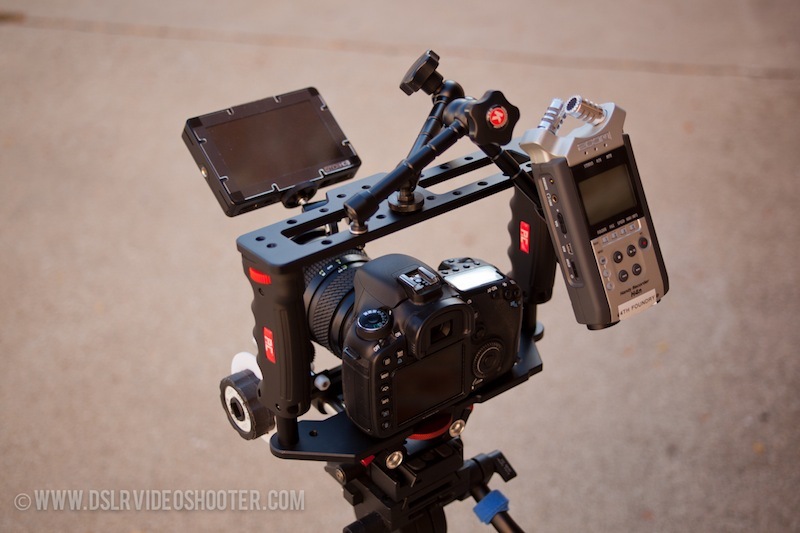 There seems to be an infinite host of rigs available for the DSLR video shooter these days. 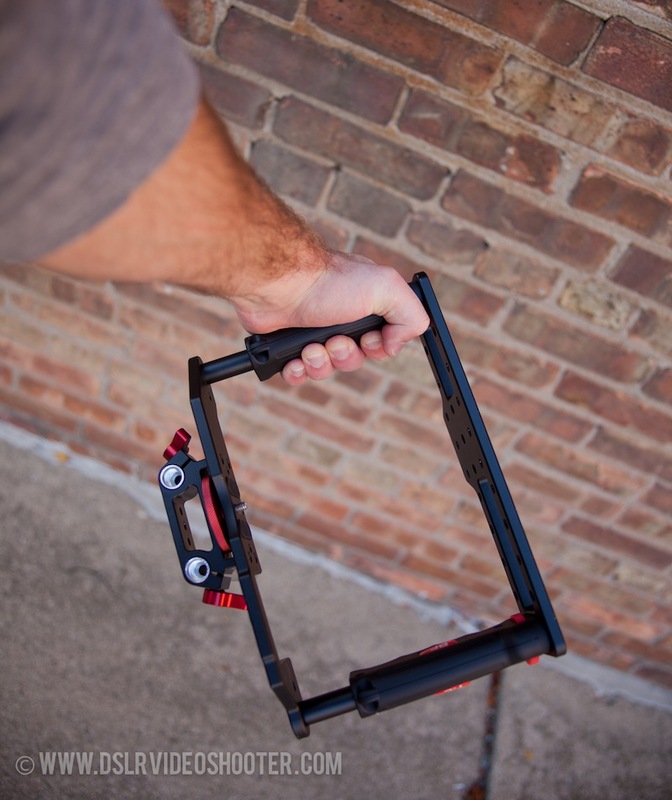 From the big brands like Zacuto, Redrock Micro and Letus Direct, to smaller machinists on Kickstarter, it is easy to find something that will get the job done. What is not easy, is finding something that will get the job done well. This is where the Gearbox DSLR cage comes in. I’ve had the opportunity to use this cage for over a month, and am VERY happy with what I have found. The first thing you notice when you pick up the Gearbox Cage is how solid and balanced it feels. I was reading about the rig (before I had the chance to try one) and I have to say I was worried that the plastic handles would cause the cage’s strength to take a hit. But upon holding the rig in person, it proved to be rock solid. Handles aside, the rig is made of thick black anodized metal. And once you tighten down the handles, nothing moves or budges at all. 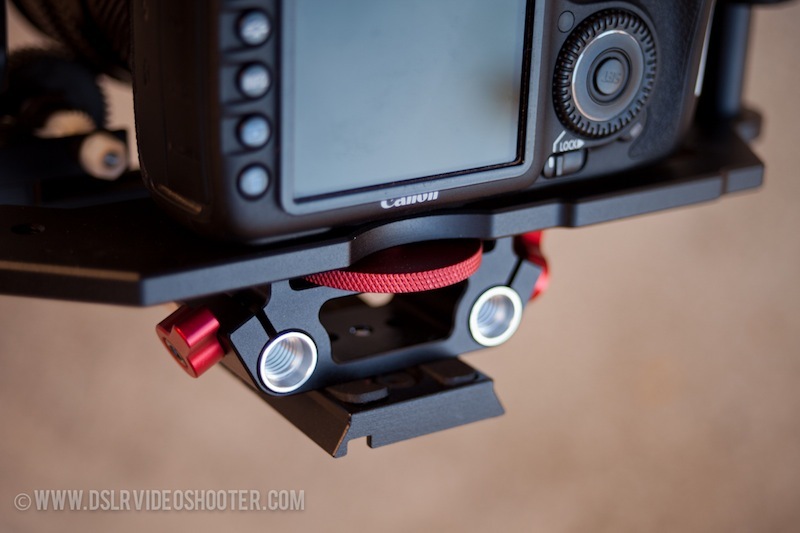 Rod adapter (attaches to bottom plate). 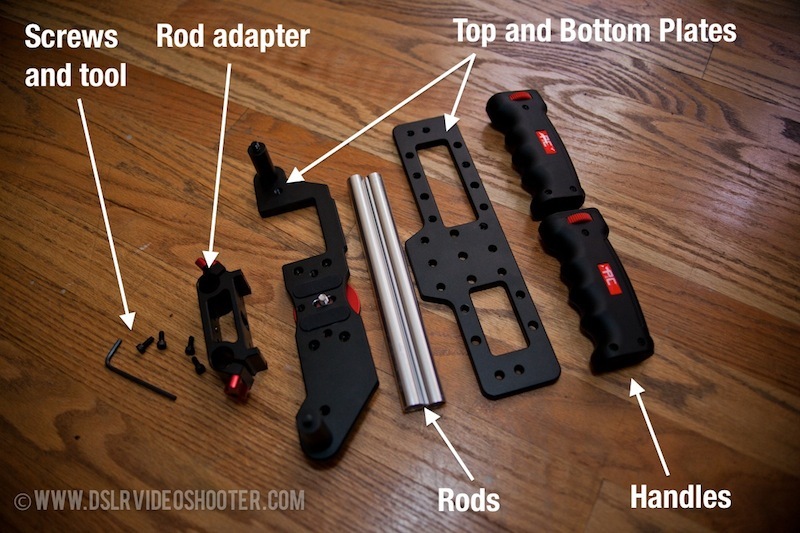 You can also buy the original Gearbox rig (GB-1) which does not include the rods for a lower cost. Even with the extension adapters attached, monitor, Canon 7D, H4n and accessories arms attached, the GB handles do not move at all. Build quality gets 5 out of 5. The functionality of the Gearbox cage is outstanding. There are 14 – 1/4-20” threaded holes and 9 pass through holes for mounting accessories. I used cheap accessory arms to mount a monitor and H4n to the cage. These really give you the most flexibility for fitting extra gear to your rig. 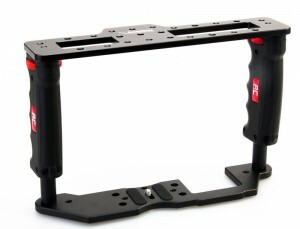 The top plate has 2 cutaways allowing the camera operator to see the camera settings and the dial from above the rig. This is a small, but very nice feature. It also keeps the weight down a bit without that extra metal. The bottom plate has a slot cutout for battery access. This is the only thing that I didn’t like as much on the rig. 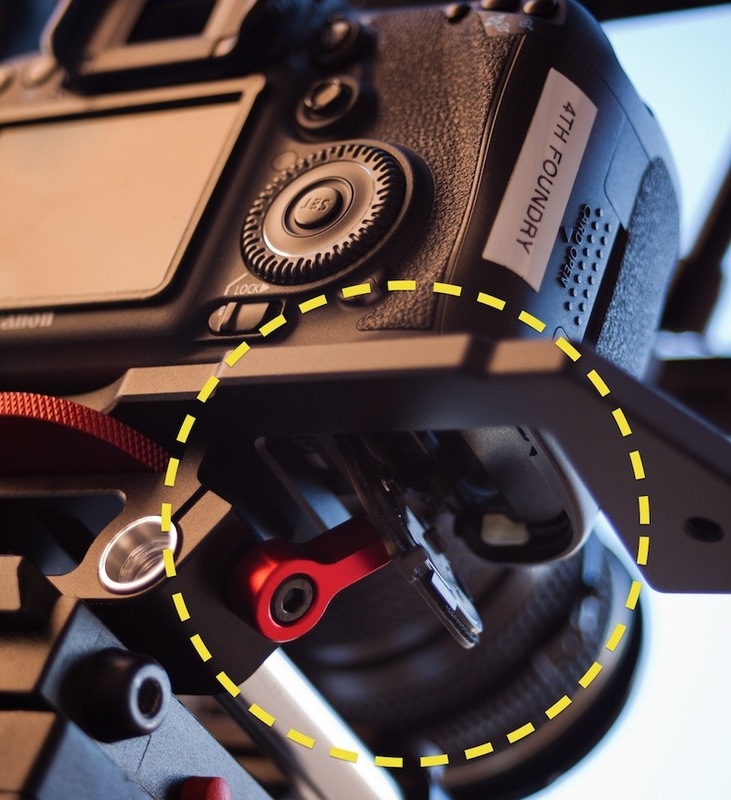 While the slot is in the perfect position, it can be blocked by one of the knobs that is for tightening the rods to the rig (see image below). So depending on where the knob is, you might run into that problem. Tightening up the camera to the cage is done with a red disc, which works surprisingly well. 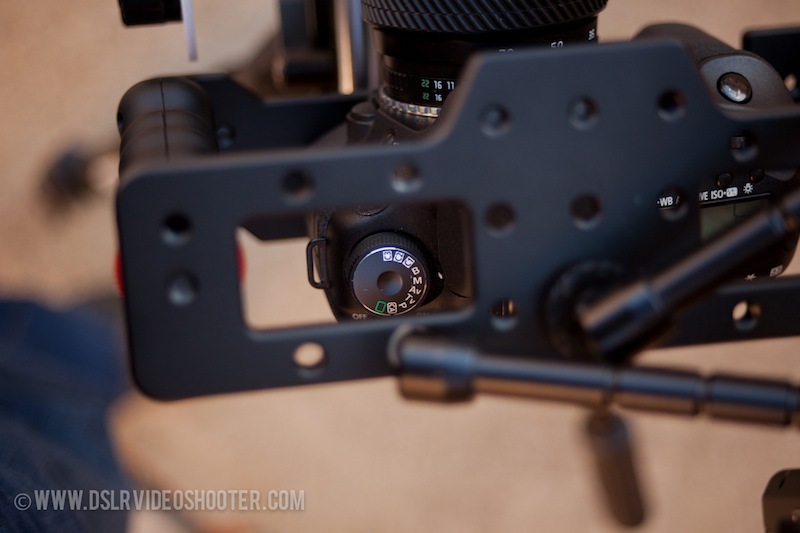 I prefer a flathead bolt to get things super snug, but this way it is easier to remove the camera if you aren’t going to leave your camera in the cage or use a quick release system. You can also move the camera thread back and forth. This gives you a little playroom and could come in handy when switching from long lenses to short primes. The width of the rig is perfect as well. Access to the card slot is easy and makes changing out cards a breeze. Can’t tell you how annoying it is to setup your rig and find out you have to dismantle it to get your card back out. The handles can be adjusted using the thumb wheel at the top of the handle, and the hex screw at the bottom. 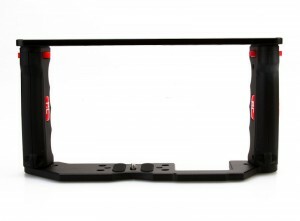 The rods and rod attachment is attached via 4 screws on the bottom plate. The included rods are the perfect length for most rigging uses and don’t slip at all. Another feature on this cage is the handle extenders. 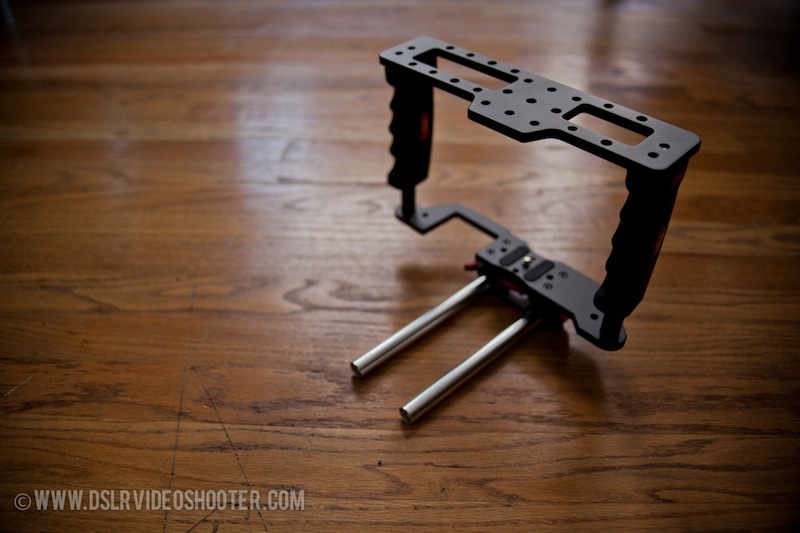 You can keep the rig short or add some extra space for a quick release system. I like to leave the extenders on. This gives me some extra breathing room for cables, accessories etc. 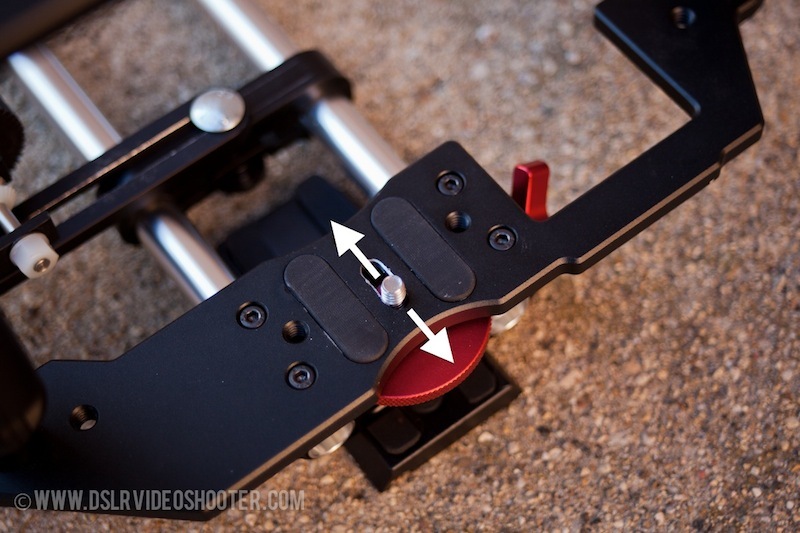 The rod adapter also has 3 – 1/4-20” threads for attaching a quick release plate for tripod use. You can score the GB-1 (cage without rods) for $89 and the GB-2 (with rods) for $120. I think these prices are very competitive. Given what the cage is going up against, they could have sold it for $150-400. So the price is better than right in my book. This earns the Gearbox Cage a 5/5 for price. I have played with a lot of rigs and cages over this past year, and to be honest, the Gearbox Cage is the first one of its kind that really got out of the way and let me operate the camera. 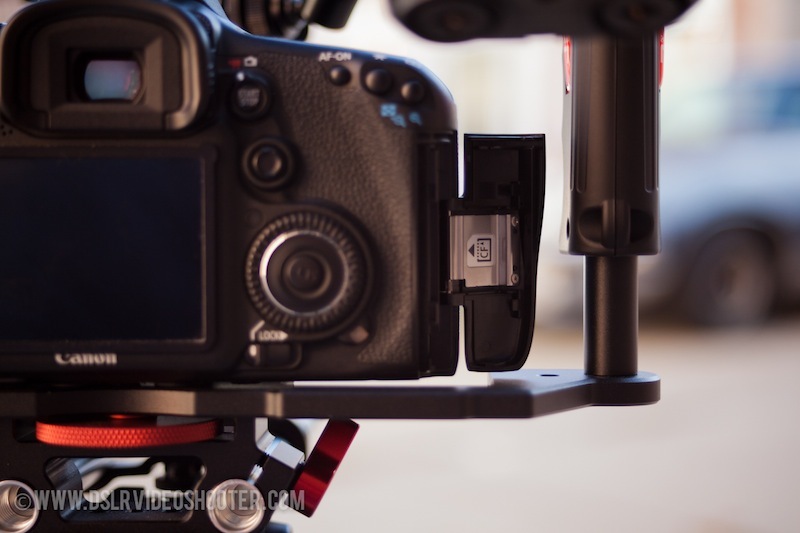 Cages are hard to get right, especially if you are aiming to fit them to the growing number of video DSLRs in the market. 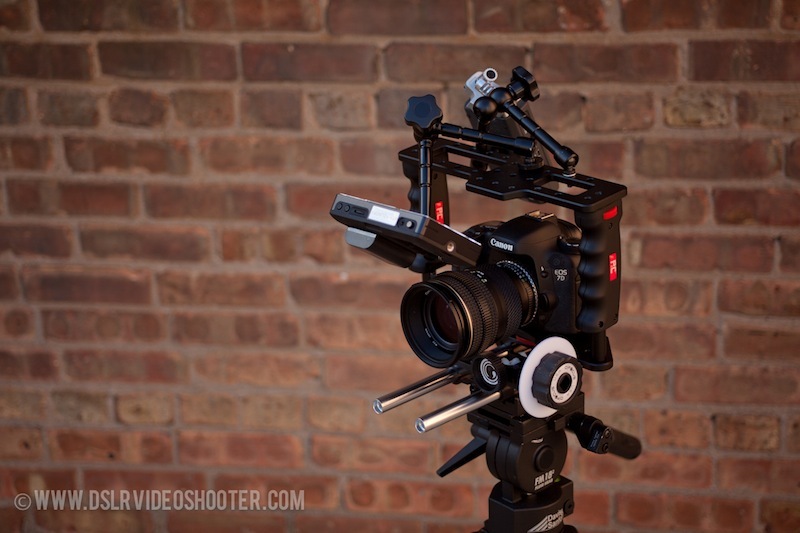 Big props to the fine folks at Photography and Cinema for such a great rig. 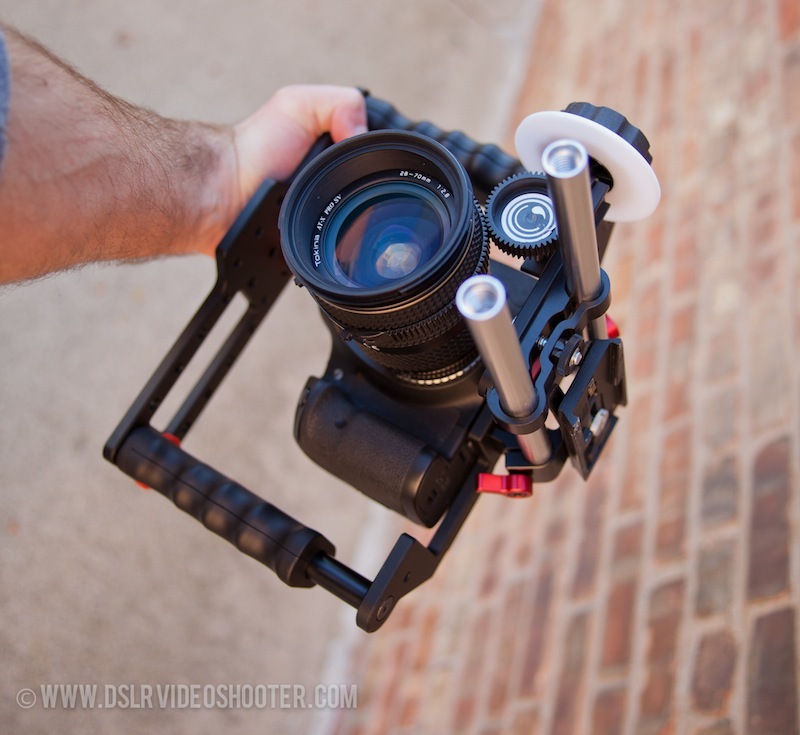 This Cage is a solid tool for anyone looking to protect and accessorize his or her camera. 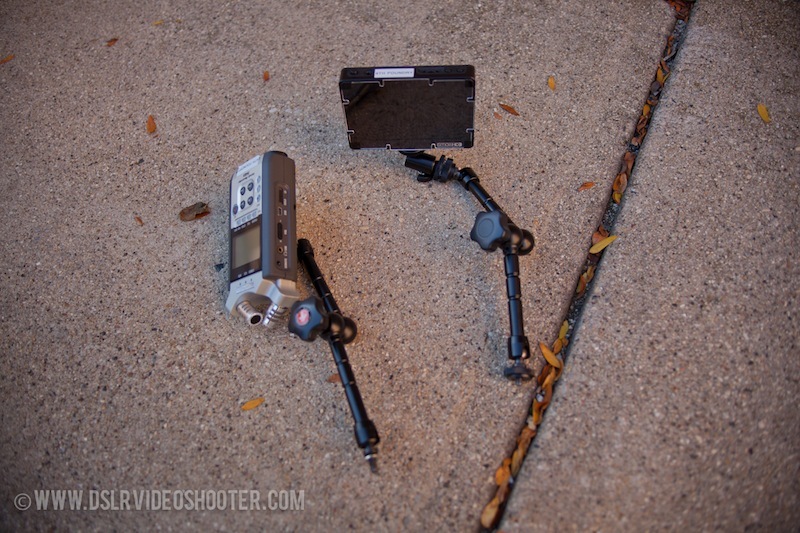 Whether operating handheld, or on a tripod the Gearbox Cage is an obvious winner. Hmm, I been looking for a type of cage and this looks exactly like what I need. 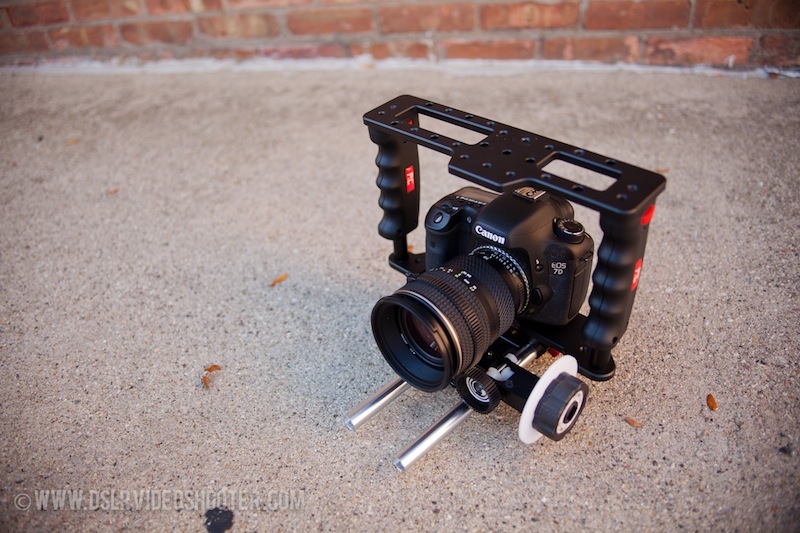 Some of these DSLR rigs can be so over priced. What follow focus are you using though? Its a killer cage! 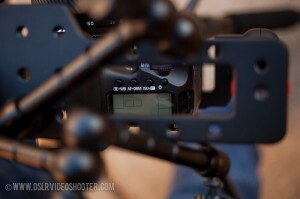 I have the D-focus mounted with the rig. Hello, really nice review, but I like your video-reviews more. Also I wonder iff you could compare the to the figrig? 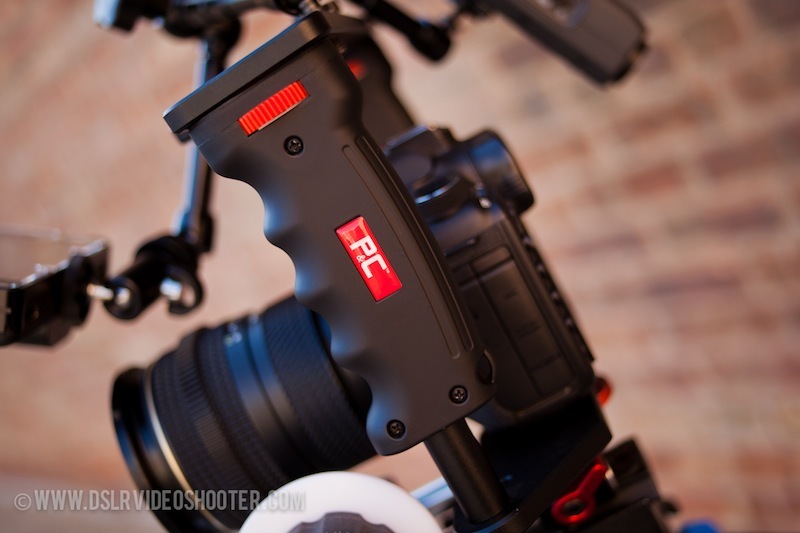 say I use this with a battery grip– do you think i’d still be able to use the follow focus? Yes. I have a cheap follow focus mounted to the right 15mm rod. 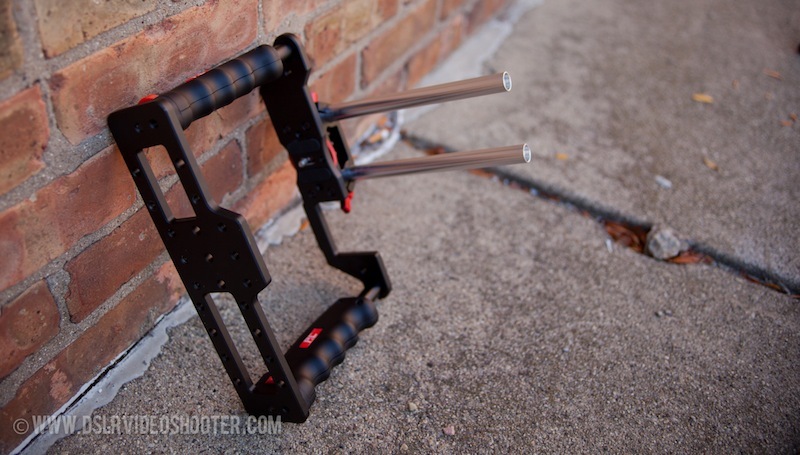 It is height adjustable and fits perfectly onto this rig with a battery grip and handle extensions in place. 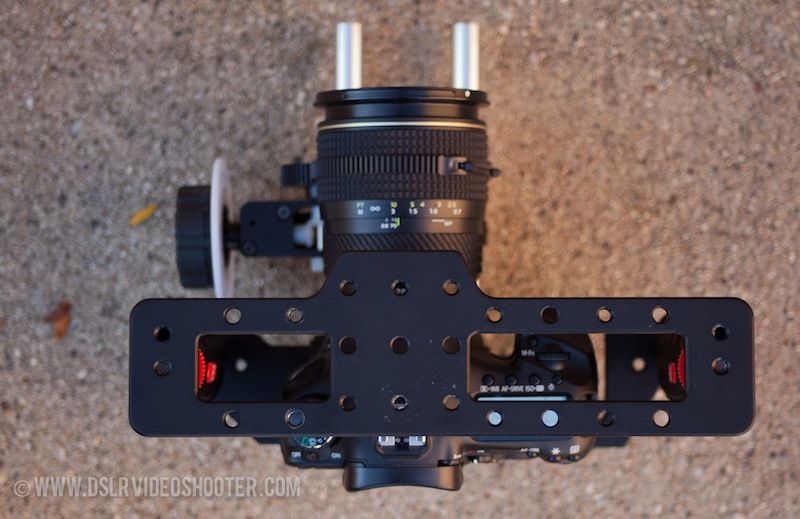 Which follow focus is it? would you recommend it to me?